Well I did get out last night, thank the gods, and the movie was wonderful. 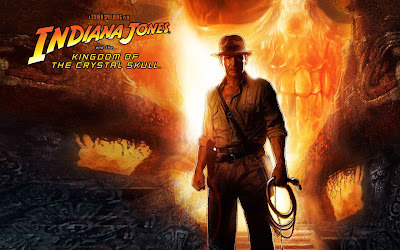 It was everything I had expected it to be for an Indiana Jones movie and I was not disappointed in the slightest! Harrison Ford was great as always, a little bit slower and creakier but I was impressed that they managed to make a great movie . And we saw a TON of previews for movies coming out that I want to see, the Mummy is back for a third movie and I looooved those, X-Files (holy I CAN'T WAIT!!) Journey to the Center of the Earth, Hell Boy 2, the newest Batman, man, we could spend the whole summer in the theater this year! My mood has improved but for the fact that I have to go in to work tonight for 4 hours. Its such feast or famine, I have worked something crazy like 7 out of the past 9 days, then Fri-Mon next weekend, I am just damn tired at this point, BUT then after that, I only have weekend shifts booked for most of the summer.....I just can't help but take the shifts when I can get them, but man, I am tired out. Its a good thing I like my job! And On a Happy Note..